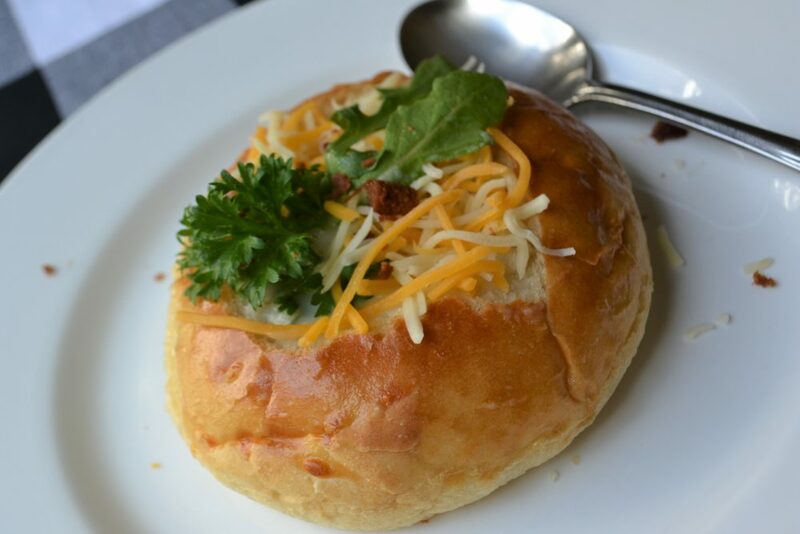 Serving soup in a Bread Bowl makes dining fun. 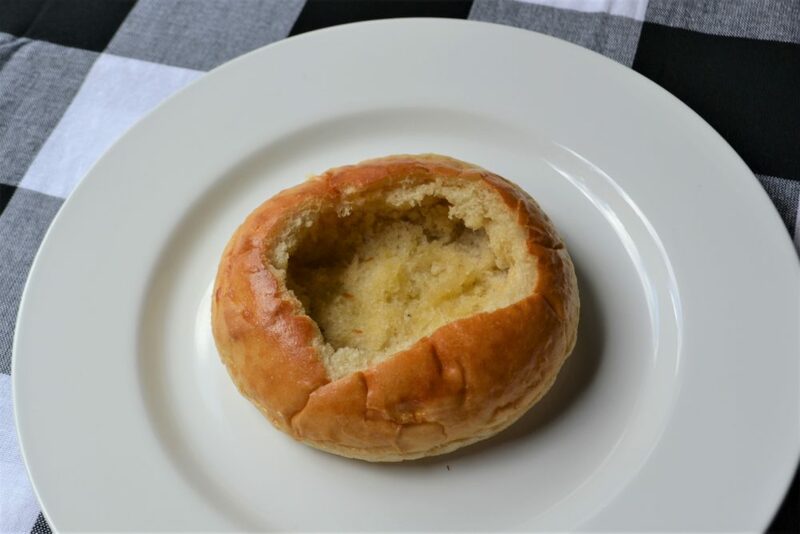 This bread bowl is easy to bake and fill. 5 simple ingredients, yeast, flour, honey, olive oil and salt is all you need to make these round serving bowls. Creamy Bisques and chowders are best soups for these bowls. When you finish sipping the soup, eat the bowl! Bread Bowl without soup. After rolls are baked, a 1/2″ slice is cut off the top of each roll and scooped out leaving an 1 ” around the rim to keep the soup inside the bowl. Toasting the bowl creates a barrier for soup to stay in the bowl. You will want to serve this bowl with soup immediately. To toast, place hollowed bowl on baking sheet and bake at 425 for 8-10 minutes. Brush with olive oil if desired before and after baking. 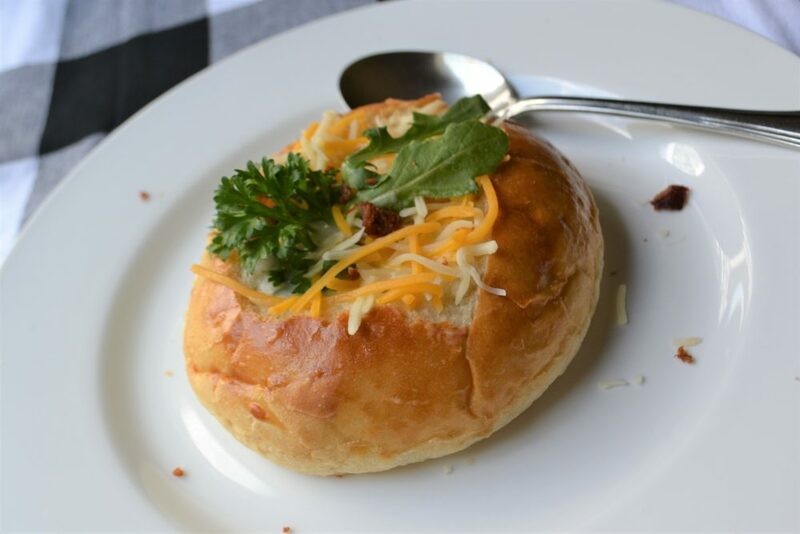 Bake and Fill this bread bowl with creamy chowders and bisques for best results. 5 ingredients, yeast, flour, olive oil, honey and salt makes this easy to stir up and bake. Hollow out baked bowls and fill with soup. In mixing bowl, add one cup flour, dry yeast and salt. In glass microwaveable dish or cup, microwave 2 cups water to 115-120 degrees. Add honey and olive oil to warmed water, stir, then add to flour and yeast. Mix together with bread dough whisk, let sit for 5 minutes. Transfer mix to stand mixer with bread dough hook, add remaining flour in increments until the dough is mixed and forms a ball inside the mixing bowl. The dough will leave the sides of the bowl when you dough is ready to allow to rise. Remove dough from mixing bowl, on lightly floured surface gently knead the dough for 5 minutes. Place dough in a greased bowl and cover with tea towel or put in warming drawer until dough doubles in height. Punch down dough and cut dough into 6 equal sections. Shape the dough into balls, do not flatten. Place on a parchment lined or lightly greased baking sheet, cover and let rise in a warm place 30 minutes. ( do not allow the bowls to rise longer than 30-45 minutes, they will over rise and not work well). Brush rolls with egg wash, make a couple of shallow slits across top of each round with sharp knife. Brush with more egg wash.
Bake 15 minutes or until tops are golden and bread sounds hollow when lightly tapped. Transfer to wire rack to cool. When ready to serve the soup, cut off 1/2″ from top of each roll, hollow out center leaving a 1″ edge around the new bread bowl. Toast bowl if desired. To toast, brush inside the bowl with olive oil and place in 400 degree oven for 5-8 minutes. Be careful not to burn. Fill bowl with soup and serve immediately. You can mix the dough and place in refrigerator for up to 2 days if you want to make them ahead. To do this, bring the dough to room temperature and shape into rolls, allow to rise and bake as directed. 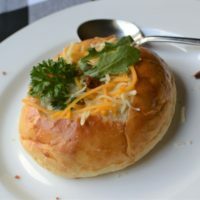 Creamy Potato Soup with shredded cheese, bacon bits, parsley with arugula leaves as garnish fills this 8″ round bread bowl. Serve up a hearty bowl of soup with a fresh baked bread roll. Hope you will be baking soon. 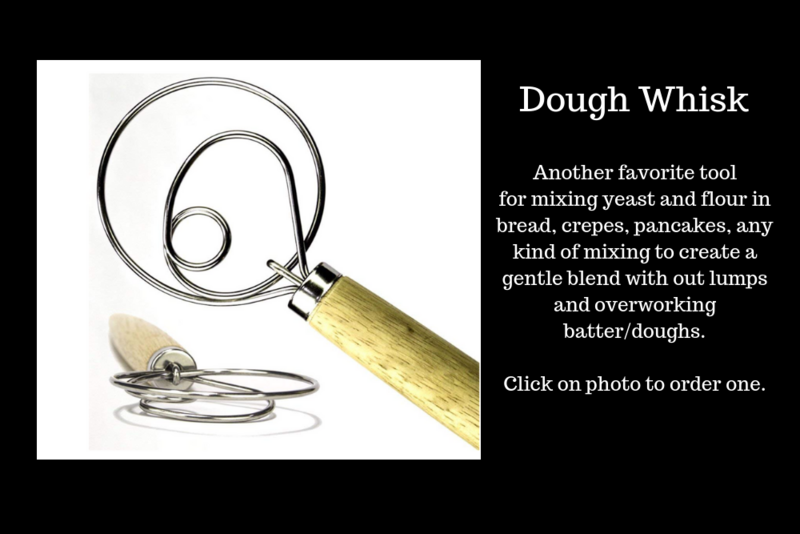 Grab one of these Dough Whisks.. It is an amazing tool you will use over and over.